WIN 4 x 3-DAY PASSES FOR ROUND 1 OF THE 2019 WSBK SERIES AT PHILLIP ISLAND! High octane, World class racing and one the world’s best race tracks : there’s no better way to spend three days of summer – you and your best mates could win four tickets, with pit access as a guest of the Landbridge Racing World Supersport race team courtesy of R&G Racing. Enter early and to give yourself the best chance of experiencing one of Australia’s biggest Motorcycling events and party in style. 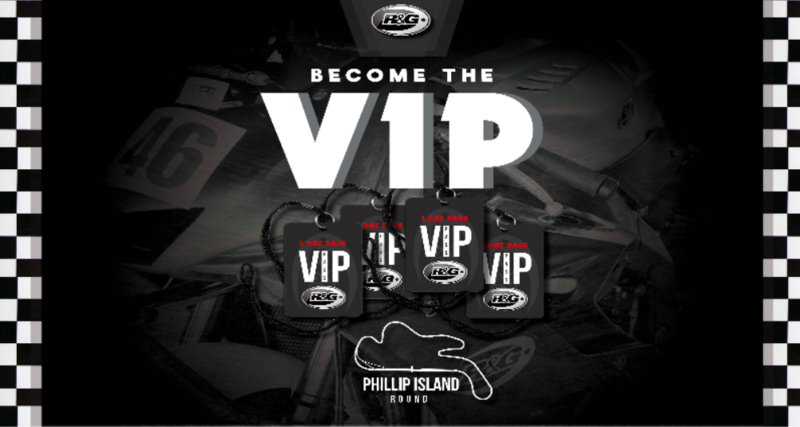 For your chance to win, you must be 18 years or older and simply purchase any R&G Racing product between 10th December 2018 and 8th January from an authorised Australian seller, upload a copy of your receipt below and in 25 words or less describe why you want to see the WSBK at Phillip Island. R&G products are made for almost every make and model of motorbikes, making your products of choice almost limitless. • Team guest of Landbridge Racing with access to the pits. Entry to the event with access from Friday to Sunday to spectator locations as well as the pits as a team guest. Will be able to base yourself with team and enjoy all of Philip island beauty and racing. • Purchase ANY R&G product during the campaign period. • Upload receipt (Invoice) below and in 25 words or less tell us: why you want to see the WSBK @ Phillip Island. • Competition commences 10 December 2018 and closes 8th January 2019. • Winner drawn on 10th January 2019. • Winner contacted 10th January and announcement on our Facebook page. • R&G products must be purchased from an authorised Australian R&G reseller. • One entry per invoice. • Competition open to retail and trade. • Open to Australian residents over the age of 18. • Prize is non-transferable and cannot be redeemed for cash.